Sewcializing with a Sewcialist – Meet Meg! Hello fellow makers! I’m Nisha Williams and from time to time I’ll be taking a break from my blog, Blue Sunday, to hang out with you all over here! I’ve been sewing for a little over 3 years, but the last year my sewing has improved greatly (meaning … I can wear what I sew in public!). What changed? I added people into the mix. While I struggled to learn to sew on my own with online classes and You Tube videos … it wasn’t until I discovered this world of bloggers who so openly share their knowledge, techniques, and resources that my sewing skills have taken on new heights! When Gillian asked if people would like to write for this blog, I thought wouldn’t it be great if we could really get to know the people we see on the Flickr page. We see what they make … but what inspires them? How did they get their start? How do they continue to grow? Every Sewist has a story, and every month I’ll bring you a new sewist from the Flickr pool. Grab your favorite beverage. Make yourself comfy while we “sewcialize” for a bit. Let’s hang out with Meg McCarthy or on Flickr … McCarthy_Meg 1979. Hello Sewcialists! Thank you so much for choosing me to interview, Nisha! I am honored and a bit surprised. I still feel like a sewing newbie, so the idea of sharing my knowledge and resources is funny to me… I have knowledge to share?! How did you get your start sewing? My mother is an extremely accomplished sewist: garments, quilts… pretty much anything you can think of, she’s sewn it. She was always sewing (and knitting and crafting) when we were growing up, so I was always steeped in it. Despite her best efforts to teach me, I only had a fleeting interest in sewing as a child, making a project here and there. She bought me a beginner sewing machine when I was in my 20’s and I expressed an interest, but even then I really hadn’t been fully bitten by the sewing bug. It wasn’t until I moved abroad a few years ago, struggled to find a job, and was quite lonely that I began sewing more intensely, spurred on by the active, inspiring, and super supportive online sewing community. I used a lot of online resources, mainly, to answer sewing questions: tutorials, YouTube videos, blogs. Now I’ve learned so much that I can share tips with my mom! She’s trying her hand at sewing with knits after my recent knit sewing successes… fun! What are a few of the ways you learn new skills and challenge yourself? What is your best sewing organizational tip you can share and how has it helped keep you organized? Ha ha ha… organized? I don’t think I am very organized. I go in spurts: massive clean-ups and organizational overhauls of my sewing stuff followed by months of messing up said organization by pulling fabric and patterns out for inspiration and then not returning them to their proper location for weeks and weeks. What is your favorite online shopping retailer (for sewing fabric, notions, supplies) and why? I live abroad (Bangkok, Thailand and previously in Jakarta, Indonesia) and only recently have a reliable means of receiving packages, so I actually haven’t done all that much online fabric shopping. I’ve had decent although occasionally mixed experiences with Fabric.com and Girl Charlee, but am excited to try a couple shops I’ve learned about via other bloggers (Michael Levine, Cali Fabrics, Fashion Fabrics Club). Also, over at Imagine Gnats, Rachael is seriously the world’s fastest shipper (she ships same day most of the time!!) and has some amazing fabrics in her curated collection. What sewing tool can you absolutely not live without and why? Seam ripper, for sure. Cures all sewing ills: pieces sewn wrong sides together, wonky stitching… all common occurrences in my sewing! A combination: other sewing bloggers (so many creative folks out there! ), ready-to-wear browsing (Anthropologie, etc. ), people-watching. Bangkok has some amazing people-watching, clothes-wise. People are not afraid of outside-the-box fashion here… funky fabrics, pattern mixing, super bright colors, crazy details. Jakarta people-watching was also fun: gorgeous batik and ikat fabrics in all sorts of fun combinations. Highly inspiring! When I first started sewing I was immediately posting my stuff on my blog, but otherwise I was a bit shy about “sewcializing.” I did a lot of lurking. Recently I started getting more into it, realizing how lovely and supportive everyone in the sewing world is and how fun it is to share this fabric/sewing/garment-making obsession with others who “get” it. So now I’m sewcializing all over the place, including on my blog, Twitter, Instagram, Kollabora, Flickr, participating in sewalongs, commenting on blogs, participating in Me Made May, etc. Sewcializing more has brought me some awesome opportunities to contribute to other blogs, participate in blog tours and even do a little bit of pattern testing, which has been really fun. I might even have a sewing meet-up soon, even though I live so far away in Bangkok, and I couldn’t be more excited! What’s your proudest sewing moment to date? Hmmm… I can’t decide! Maybe my ikat By Hand London Victoria blazer? Love that thing! At the time I made it, it was by far my most complicated make. In that same vein, I was quite proud of my plaid Negroni for my husband… it’s not quite his style, but I think I did a great job putting it together, pattern matching and sewing the bias yoke and pockets! 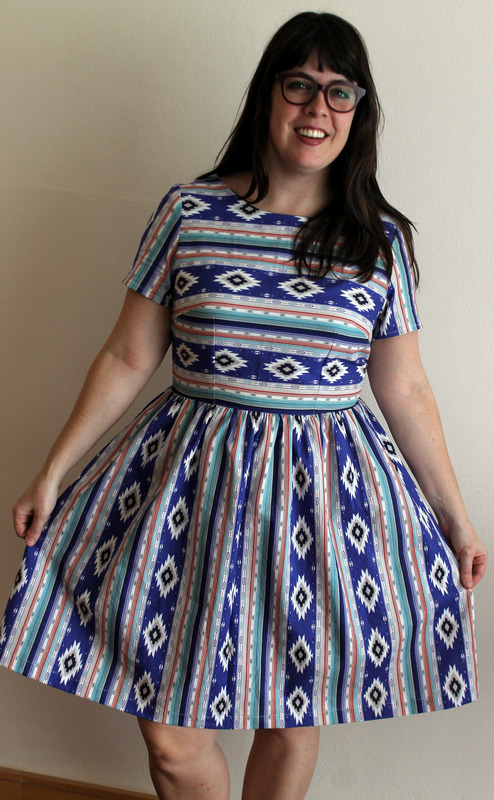 But perhaps one of my more recent sewing adventures makes me the most proud: I am super proud of my successful invisible zip and (almost) pattern matching on my Southwestern Emery dress (first picture in this post). I worked really hard on it and think it came out pretty great. Plus, I drafted neckline facings for the Emery, which was a first for me. Seriously, don’t you just want to hop on a plane, fly to Bangkok and have a beer with Meg?!? Meg thanks for taking the time to provide all of the detail and providing access to your pictures. We appreciate your willingness to Sewcialize with us and providing a peak us into your sewing & crafting world. Want more Meg? Check out her blog. Do you have any burning questions you would like to add to the interview list? Leave them in comments below or email me at nishawilliams [at] msn [dot] com. And don’t forget, scrappy September has just started. What will you be making? We’ll be following the Flickr page for your amazing Sraptember makes. Happy Sewing! I just love your Southwestern Emery dress. And my seam ripper is my friend too! Thanks so much, Linda! I always have my seam ripper handy. Right now: ripping out wonky, mismatched darts on a Sureau dress! Thanks again for interviewing me, Nisha! So much fun! Can’t wait to here more about other Sewcialists, too! Meg, it was such a pleasure!!! Yes there are more Sewcialists to come!!! Nisha, congratulations! Great posts, great idea, and I can’t wait to read more! Gillian, thanks!! It was a ton of fun!! We have awesome ladies in the months to come! I totally identify with your stories about your mom – My mom bought me my own sewing machine at 18, but now my sewing has motivated her to buy a new machine for herself and get into sewing knits! She was a big help when I was learning to fit clothes. There’s something satisfying about returning the favor for your mom, isn’t there? What a fun interview! Love all the outfits Meg is modeling in these pics!